Use the forward feature in your e-mail system. When Lissette Acosta-Corniel and her mother first came to the U.S. in 1989, they cooked, cleaned and paid rent at a relative’s house to sleep on the living room sofa. She made a promise to her 10-year-old sister who remained in the Dominican Republic to pursue a college degree and make a better life than the poverty-stricken one she left behind. On May 18, she fulfilled that promise when she walked the stage to receive her doctoral degree. 6-9 p.m., to sample several brews and learn about pairing food with the right ales, stouts, pilsners and other beers. Take an exclusive tour of the award-winning brewery, inhale the yeasty aroma of fermenting hops and malt, and learn what it takes to make a great beer. Price of $10 per person includes six beer samplings, a pint of beer of your choice and a hearty hors d’oeuvres buffet. Register online by July 19. Want to Play Some Kickball? Syracuse Regional Volunteer Mark Johnson ’06 is starting a UAlbany co-ed recreational kickball team. Please email Mark if you are interested in being part of the fun. Game day will be determined by availability of interested parties. Games run from the beginning of July through the first week of September and are played at Syracuse Kickball Park in Liverpool. Sign-up deadline is June 14. Metro DC Alumni Night at the Nationals! Catch the DC Nationals as they take on the New York Mets on July 26. Before the game, connect with alums and grab some food at the Fairgrounds, 1299 Half Street, SE, Washington, D.C., at 5:30 p.m. Then head across the street to watch the Nationals play the Mets at National Stadium at 7 p.m. Game ticket is $24. This was a sellout last year and the tickets are limited -- register today! Join Coach Bob Ford and football alumni to welcome a new era of UAlbany football in the Colonial Athletic Association (CAA) Conference. Enjoy an afternoon of golf, raffle prizes and a silent auction July 13 at the Normanside Country Club in Delmar, N.Y. Check our website for more details and registration information. William Lamson’s “A Certain Slant of Light” and Michelle Segre’s “Antecedents of the Astral Hamster” will appear concurrently at the University Art Museum June 27-Sept. 14. There will be an artists’ reception June 27, 5-7 p.m. Lamson works in video, photography, performance and sculpture. His work addresses issues of masculinity, amateurism, science, play and the elusive quest for personal heroism. Segre will display idiosyncratic drawings and new sculptures that use reworked armatures and recycled materials in combination with elements such as rocks, milk crates, papier mâché, colored yarn, and plaster to reflect her intuitive, highly personal approach to materials. Details. More than 3,100 students celebrated during UAlbany’s 169th commencement ceremonies May 18 and 19. 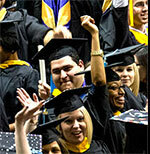 UAlbany graduated 2,250 undergraduates and 866 graduate students. Republic Records founders and "The Voice" talent producers Monte Lipman ’86 and Avery Lipman ’88 delivered the keynote at Sunday’s undergraduate commencement. The brothers brought along a surprise for the graduates -- Cassadee Pope, Season 3 winner of “The Voice,” delighted the audience by performing two songs at the ceremony. Jack Henion, a leading scientist in the pharmaceutical industry, delivered the keynote address at Saturday’s graduate ceremony. Details. UAlbany Professor of English Lydia Davis has won one of the most prestigious awards in all of literature: the fifth Man Booker International Prize for fiction. The $93,000 award is presented every two years to a living author of any nationality for a body of work published in English or widely available in English translation. Details. May 10. The awards reflect President Jones’ aim of advancing UAlbany as a community-engaged research university. Details. In collaboration with the State University Construction Fund, UAlbany is moving forward with plans to establish an Emerging Technology and Entrepreneurship Complex (E-TEC). The new complex will bring together researchers, entrepreneurs and investors to provide the technology transfer and commercialization resources to drive economic growth, create jobs and enhance New York’s competitiveness in key industries. Serving as the hub to this complex will be a new $165 million research and development facility. Details. UAlbany atmospheric scientists Lance Bosart and Ryan Torn are part of an elite team of researchers working with the National Center for Atmospheric Research in Boulder, Colo., to improve the models that forecast thunderstorms. Details. The Secretary of the Army, an international coordinator for nuclear threat-reduction programs and a campaign finance expert for a multinational mass media corporation were among the internationally recognized scholars and public policy leaders honored by the Rockefeller College of Public Affairs & Policy May 17. Details. This spring, the work of Financial Analyst Honors Program students Michael Biagi ’13 and Kelechi Nwokocha ’13, was featured in the Economics Scholars Program for Undergraduate Research hosted by the Federal Reserve Bank of Dallas. In the past three years that UAlbany has participated in the one-day undergraduate economics-research conference, 10 of the 11 papers submitted were accepted, far surpassing the general acceptance rate of 58 percent. Details. The National Center for Excellence in Homeless Services will be launched at UAlbany in July 2013 with funds from an anonymous donor. The program hopes to replicate the success of the innovative service model of the Committee on the Shelterless (COTS) to advance prevention and intervention with homelessness. This national center will disseminate the Restorative Integral Support (RIS) model, co-developed by Heather Larkin and John Records and first implemented at COTS. 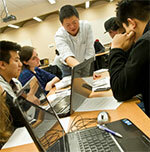 Rockefeller College students and faculty have challenged alumni to invest in the college. During the last six weeks of the semester, Rockefeller students and faculty raised $4,400. They are now challenging alumni to match that on a 2:1 basis. The goal: $8,800 by June 28. As an added incentive, a very generous Rockefeller alumnus has agreed to match all alumni donations dollar for dollar up to $5,000! Please give to the Double Challenge today! Associate Professor Eric Hardiman has been awarded a grant by the New York State Office of Mental Health to evaluate a pilot project utilizing peer-to-peer interventions. The PFC Joseph Dwyer Veteran Peer-to-Peer Support Pilot is being implemented in four New York State counties: Jefferson, Rensselaer, Saratoga and Suffolk. This pilot recognizes the need to effectively address the challenges experienced by veterans suffering from PTSD. Winning eight America East championships during the 2012-13 season, UAlbany has claimed the conference’s Stuart P. Haskell, Jr. Commissioner’s Cup for the second time in school history. The cup annually recognizes the strongest athletic program in the America East Conference as determined by a scoring system, which rewards a school for success both during the regular season and championship competition in the conference’s 20 sports. Details. The Great Danes officially broke ground for a brand new track and field venue that will allow the UAlbany track and field teams to host meets during the 2014 season. The new venue will have a nine-lane IAAF certified track; the surface will be the Olympic-caliber Beynon BSS 2000. A natural-turf infield will include a throws area and a separate hammer-throw area adjacent to the venue. Details. Continuing to fill his trophy case in just his sophomore season, UAlbany men’s lacrosse attackman Lyle Thompson garnered the 2013 United States Inside Lacrosse Association Lt. Col.
J.L. (Jack) Turnbull Award May 24. Thompson became the first Great Dane in program history to be honored with a major USILA award. The Jack Turnbull Award is given to the top attackman in Division I Men’s Lacrosse. Thompson also is a finalist for the Tewaaraton Award after putting together one of the best seasons for an individual in NCAA men’s lacrosse history. Details. The UAlbany men and women earned a fifth consecutive sweep of the America East Outdoor Track and Field Championships in May at Binghamton University. It also was the fifth consecutive championship for the Great Dane women; the men stretched their record-title streak to nine straight years. Details. Alumni giving makes it possible for today’s UAlbany students to have the same great experience you had. Please don’t forget to show your support before the fiscal year ends June 30. Give online to put your contribution to work immediately in support of the school, department or program that means the most to you. In the Alumni Association’s 2012-13 annual report, learn how your association is helping to build lifelong connections, engaging alumni and students, and expanding alumni services. Details. Through her volunteer efforts, UAlbany senior Chantelle Wilkinson wants to inspire young women not only to attend college, but to get involved. Wilkinson understands the benefits of community engagement, as she was the recipient of others' help and enthusiasm when she was preparing for her prom. Details. A redesigned UAlbany custom license plate from the New York State Department of Motor Vehicles is now available in both passenger and commercial classes. The UAlbany plate can be ordered at any DMV office. You can also order by calling the DMV Custom Plates Unit at (518) 402-4838, Monday through Friday, 8 a.m.-4 p.m., or online. Are you looking for an opportunity to volunteer with minimal time commitment? Here’s your chance to give back to UAlbany. Check out ways to give back or contact the Alumni Association for information.